We lead the local area with the lowest posted rental rates on all equipment to ensure your homeowners enjoy the greatest cost savings. Home builders also receives first month rental at no charge. Water heaters will be delivered to the basements of your new homes within 5 business days from order receipt. Fast, reliable service response 24/7, 365 days a year. ENERGY STAR © labeled tanks are standard. 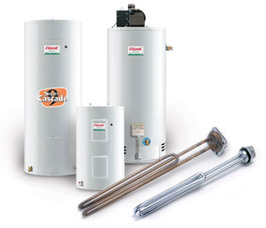 We supply a top line Canadian made high quality gas-fire and electric water heaters including power-vented, direct-vented models in both condensing and standard models. We also carry a full line of Rinnai tankless models in both condensing and standard models. Prompt response to site issues with respect to delivery and service. Technical training on specific water heaters can be provided for your sales personnel and informative brochures regarding our rental program will be supplied for your new home purchasers. *electrical, waterline, gas line and venting charges may apply.